Mounted Points Kit finishes corners and edges. Providing 7 shapes of cotton-fiber mounted points, MX Plus Kit can be used on stainless steel, aluminum, and exotic metals. It is suited for blending and finishing coarse scratches left by carbide burrs and other aggressive products. Featuring heavy grain content of aluminum oxide abrasives and choice of coarse, medium, and fine grits in latex bond, mounted points are on Â¼ in. spindle in 1-A3, 1-A5, 1-A12, 1-A25, 1-B52, 1-W177, and 1-W220 shapes. A new kit that provides a broad selection of cotton-fiber mounted points for second-step finishing on stainless steel, aluminum, and exotic metals is being introduced by Rex-Cut Products, Inc. of Fall River, Massachusetts. The Rex-Cut® MX Plus Kit provides users with seven of the most popular shapes and sizes of cotton-fiber mounted points for blending and finishing the coarse scratches left by carbide burrs and other aggressive products. Suitable for prepping parts for final finishing, grain-in, and painting, these mounted points are ideal for stainless steel, aluminum, and exotic metals and will reach into corners, finish edges, and deburr holes. 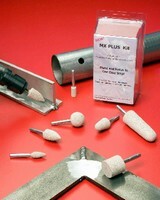 of coarse, medium, and fine grits in a latex bond, the cotton-fiber mounted points included in the Rex-Cut® MX Plus Kit are on a 1/4" spindle in 1-A3, 1-A5, 1-A12, 1-A25, 1-B52, 1-W177, and 1-W220 shapes. Packaged in a re-closable plastic clamshell, they leave a smoother finish, are non-loading and last longer than cartridge rolls and spiral bands, claims the firm.